Ben Wade ’17 – Thursday was the first full day in Brussels, and it didn’t disappoint at all. After getting into the city fairly late last night, it was nice to get the chance to sleep in and relax a bit this morning. However, we couldn’t rest for too long, as we had a whole new city to explore and only three days to do it. Besides, looking out our hotel windows at all the different food options in the main square meant that we couldn’t stay in bed for too long. The only scheduled event today set the tone for the rest of our day, and sort of underscored something I noticed in Frankfurt. Our trip to the European Council was filled with a diversity that I have never experienced before and that also surprised a couple other guys in the trip. In our travels today, we saw the words “European Parliament” written in 24 different languages; our presenter at the Council spoke at least 5 languages and probably could have defended himself in several more; our dinner was a choice between Ethiopian or Senegalese cuisine, decided only after walking past Greek, Indian, and Indonesian restaurants. Walking around today showed me that the term “melting pot” cannot just be used to describe the U.S. Today, I talked to an Irishman who spoke very accented Dutch, German, and English about how Chelsea was better than Paris St. Germaine (soccer, btw). Earlier, I asked for pouille mafa (spiced chicken) in a Senegalese restaurant from a waiter who only spoke French, albeit with a little help from Professors Byun and Hollander. Though these cultures and people are very distinct, there is no denying that they mix together in this city and others across Europe. Thinking of America as the only place where cultures come together is simply closed-minded to the entire world around us. Everything about this place is different from anything I’ve ever encountered: different people, different food, different architecture, and very different experiences. If anything this trip has taught me two things: everything in Europe is expensive (even using the bathroom) and it’s okay to be uncomfortable sometimes. Even though hamburgers and French fries are safe and familiar, you might find that you like spiced African chicken and döner kebab more, as a few of us found out. Though this experience is half over, I have loved every minute here and I’ll finish by giving out a huge shout-out to the Rogge Fund and Professors Hollander, Byun, and Mikek for making it possible. Like any “good” Catholic, even before flying to our layover in Atlanta I knew where I would go for mass on Sunday when we arrived in Frankfurt. While decrypting all the German websites, St.Justinuskirche seemed the best option. Though, like any “good” Catholic, one thing led to another and I never actually made it to mass on Sunday. Being one of the oldest buildings in Frankfurt, the desire of visiting the church was still real. On Tuesday, Ben Wade and I took advantage of the misty, cloudy free day and headed out to St. Justinuskirche. After considering walking to the church, Ben and I agreed we should not tire ourselves. The metro rail system would be our means of transportation and so we were off. We figured that we would get on line S1 or S2 and our cue to get off would be “Höchst.” Once the train started going we realized how far we would have needed to walk and were very glad we didn’t. Höchst was our stop and it seemed like a suburban neighborhood for people who work in Frankfurt. As we exited the train station it was clear that nearly no one would speak English, meaning Ben’s limited German would have to suffice. The church was still a hike from the station but even from a distance, we saw the arched doorway at the base of a massive stonewall. No questions asked we walked through. We entered what we thought was a garden but was actually a medieval fort. Surrounded by this very historical structure we explored many doors, stairs and alleyways that were unlocked. In one of these damp alleyways was the church we had long forgotten about due to our excitement over the medieval fort. The running joke amongst the immersion group has been that you can circle a building many times but you won’t find an open door. So we tried all the doors on the church twice and none were unlocked. We had failed to see the church and it was not disappointing because we found this fort. As a matter of fact, none of the time spent in Höchst was disappointing at all. If I had to name one of the greatest joys in being abroad it has to be that ones willingness to try new things does not make disappointment passable or ok. You can try different foods and not enjoy them but being upset or disappointed that you did not enjoy it would defeat the incentive to try anything. Put your best foot forward and try anything and everything. If you are disappointed, you are doing it wrong. Nash Jones ’16 – As I am typing this Tuesday, we are on a train out of Germany, heading to Belgium. This is my first time out of the US, and I was a bit worried about what to expect in a foreign country. I was more than a little curious about the different customs and behaviors that we would have to follow and imitate in order to be good guests. Before we left, we were informed of different things to prepare for so that we wouldn’t be in for a total culture shock. However, there are a few things in particular that are worth mentioning that took us by surprise. First, it is a rare occurrence to see somebody use their smart phone during a meal. I, Tyler Hardcastle, and Ben Wade noticed this on our first day in a nice little cafe in Frankfort. Meals are social gatherings to be enjoyed without the use of the internet or apps. It also eliminated those weird instances of people Instagramming or Snap Chatting their food, which is something to be grateful for. The second thing we noticed was how quiet everyone was. Even some of the softer-spoken members of our group noticed how loud we were in comparison to everyone else. At home, it is no big deal to yell at someone across the room. Doing that in Frankfort could draw some odd looks, and made it immediately obvious that you aren’t from the area. Even in some of the busier streets and parks, I did not hear anyone raise their voice. It wasn’t a bad thing, just different. We also learned, quite often in fact, to stay out of the bike lanes. Cars aren’t uncommon in Frankfort, but I wasn’t prepared for the sheer number of bikes that zip up and down the streets. It was usually better just to try to maintain a single-file line down a sidewalk than walk side by side like we are used to at home. Luckily, none of us was run down in the street by a bicycle, but there were a few close calls. The immersion trip has been a lot of fun thus far, and we are all excited to be on our way to Brussels. We all greatly appreciate the opportunity provided to us by the Rogge Fund and Wabash College to go to Germany and Belgium for a week and experience their cultures. This has been an exciting week so far, and I’m sure it will only get better as it goes on! 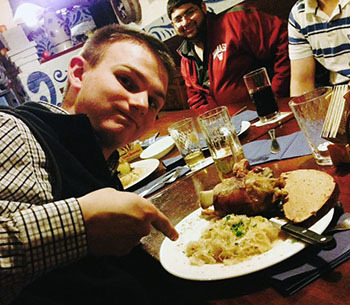 Seton Goddard ’15 – Since Monday was our first full day in Germany, we had the opportunity to spend a lot of time talking with different officials, policymakers, and civilians whose perspectives impacted the way that we viewed the European Union. Throughout our class discussions, we have questioned whether or not the European Union can survive, and if it does, whether its survival will be a meaningful one. Often, the class would conclude that the European Union simply isn’t sustainable and that there are just too many problems for it to work the way it was intended. However, our experiences today revealed quite a bit. First, it has become clear that while the E.U. may look like a train wreck from the American vantage point, there are intelligent minds guiding the monetary policy of the European Union. Like America, though, we are beginning to see where politicians take policies crafted by experts and turn them into policies that are appealing to their voters. In turn, bad policies are implemented, and in many cases, this is what Americans and the rest of the world see. Nonetheless, our discussions with people who live and work in Germany made it obvious that Americans are not the only people who are skeptical of the European Union. 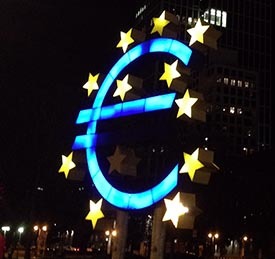 At a pub in Frankfurt Sunday night, we talked with two German interns who shared their views on the European Union, the challenges it has created, and in some ways, confirmed the things we were told at the European Central Bank today. First, while the European Union may be a “nice idea,” taking dozens of existing government structures and central banking systems and placing them under the jurisdiction of a loosely defined, constitution-less governing body leads to a lot of skepticism — even more than we might see if we spent a lot of time comparing the federalist system in the United States to the attempt at federalism in the European Union. On top of this, the students we talked to made it apparent that two of the greatest challenges in making the European Union work in a cohesive way are labor mobility and cultural differences. In other words, while Americans don’t have to think much about moving from Indianapolis to Kansas City, for example, moving from Frankfurt to London is a much bigger deal: the German who moves to London is forced to learn a new language (or expand his or her existing knowledge of English), change national citizenship (though the European Union has expedited this process substantially), and deal with differences in accreditation and licensing processes. And while some of these challenges would exist in the Indianapolis-Kansas City move, those challenges aren’t nearly as debilitating as they are in the European Union. Additionally, the students we talked with identified substantial cultural differences between E.U. states that create even more challenges as leaders attempt to craft policies. They pointed out that, even though they’re German, they don’t tell people that they’re German. They say that they’re Bavarian (meaning they’re from Bavaria, a state that is often compared to Texas in its cultural attitudes and slightly hyperbolic desires to secede), which reveals that not only do they not necessarily call themselves Europeans who are apart of the European Union, but also they don’t even call themselves Germans. All in all, even though it was only the first day, we gained multiple valuable perspectives that we couldn’t gain by staying in a classroom. The lectures, experiences, and simple conversations offer a perspective that simply wouldn’t be possible without being here. All thanks to Professors Mikek, Hollander, and the Rogge Fund. A key part of each immersion trip – the food. Josh Bleisch ’16 – Monday was the first full day of activities for class. We began by visiting the Frankfurt stock exchange. On the way there, we walked through the City Hall square. In the middle of the square, there was a memorial of a Nazi book burning that took place during the lead up to World War II. I found the site interesting and very powerful. The quote around the memorial roughly translated to: “when you burn books, you burn people.” This was just one of the many things in the city memorializing the events of World War Two. At the Frankfurt Stock Exchange, we learned about the history of trading in the city, as well as how the exchange operates today. At the ECB, we enjoyed a great presentation about the strategies of the central bank, both in good times and in crisis. We have been reading about European Monetary policy for half of a semester, but this was our first chance to speak with people actually working within the European Central Bank. 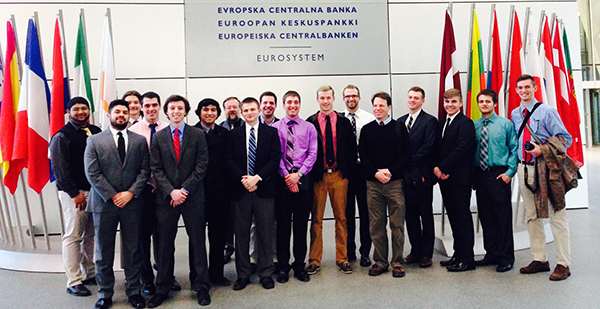 We learned so much valuable information about what the ECB has done during the Eurocrisis to ensure price stability. I ended the day by going to an Ethiopian restaurant with a few other students in the group. It was a great end to a busy day in Frankfurt! We still have most of the week left to explore and learn. I’d like to give a special thanks to the Rogge Fund for making all of this possible! Tyler Hardcastle ’15 – A cafe? As soon as we entered the cafe we felt out of place, but not unwelcome. The two waitresses were busy near the back of the shop and there was no sign to indicate that we shouldn’t simply seat ourselves. We made for a small table near the front and the four of us sat down. Then we waited. Our small cafe at dusk. This wasn’t your average trip to the Brew. Along with the rest of our class and led by Professors Hollander and Mikek, we had landed in Frankfurt, Germany Sunday morning at 6 a.m. The class, two separate courses dedicated to the Economics and Politics of the European Union, had involved two hour sections, meeting three times a week. During that time we’d unpacked the concepts of the economic and monetary aspects of a common currency, the Euro. We’d also examined the complex political interactions that led to the role out and shortly thereafter, support for the new currency. Spending the Euro, would be a completely different challenge. As we waited for one of the waitresses to approach our table, we took stock of the dining room. First, to be sure we hadn’t made some mistake in the seating process and that we were indeed supposed to wait to place our orders. Second, to see others dinner’s meals, hoping for a clue as to the menu. The handful of menus on our table were completely in German. This should have come as no surprise, we had simply set out with new direction and stopped at the first place we saw. We were far from the typical tourist haunts and began to wonder, if perhaps we’d been a bit overconfident. Each of us had prepared a few phrases, but they went no further than the requisite ‘sprechen sie Englisch?’. Despite our handicap, we had each decided what we would order based off a partial decoding of the menu. I’d found ‘lachs’ to be promising (which I presumed correctly to be lox), one opted for a Cappachino, and the others found what seemed to be ham sandwiches. In the end it was a useful exercise, but largely unnecessary. When our waitress came she was very nice and did speak English. She also brought us an English menu and offered a number of recommendations and guidance when we ordered. There was still significant confusion when it came to paying. We had a shared check for which we first put down far too many Euros and then not enough. Though ultimately, the experience was pleasant. Unsurprisingly, we found that simply speaking to people offered more help than any phrase book or our typical crutch, smartphones. We’re hoping to continue this practical learning tomorrow morning as we travel to the European Central Bank and through the week at the European Council, EU commission, and the lectures in Brugge and Belgium. Though even early on, it seems that the most informative experience is not speaking the language. Having to point, use gestures, and generally rely on others takes you completely out of your comfort zone. I usually feel a fair amount of comfort or control in dining and social situations, but had to give that up here. I’m thankful to Professors Mikek and Hollander for leading this trip and for the Rogge Fund for sponsoring our travel. 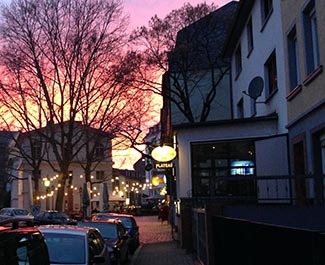 Kurt Miller ’16 We arrived in Frankfurt am Main shortly after 6:30 AM local time. After a long flight, our bodies felt the creeping exhaustion of jet lag. Upon dropping our bags at the youth hostel, myself and several other Wabash men experienced a picturesque Sunday morning along the river and ended up in the central square eating baguettes, sausages and Italian Gelatto (a treat essential for any American to experience over here). We quickly realized that Americans speak louder than most Europeans. Experiencing stares, the level of volume had to be lowered multiple times. One of the most surprising things was the difference in general street etiquette between the Midwest and Europe. Back home, I am used to smiling at everyone I see. In Deutschland, this same behavior is met with blank stares. We returned to check in at 13:00 and I immediately fell asleep. With our fist day done, I am excited for the rest of the week and plan to make the most of this trip and my time in Europe. Learning abroad, in my opinion, encapsulates the liberal arts education and allows young minds to experience the vastly different cultures, institutions, and structures making up the basis of the European way of life. With the grace of the Rogge Fund and the hard working endeavors of Professors Hollander and Mikek, our education has already been furthered on day one. I can’t wait to see what comes next! Aufwiedersehen!